From left: Jesse Darden, Omar Ebrahim, and Sarah Womble . Fleeing the rise of the Third Reich, composer Arnold Schoenberg landed in the United States as that most American of arrivals: a refugee. Settling with his family in southern California and teaching college courses, he met with MGM producer Irving Thalberg, who tried to entice him into the brave new world of film music with an offer to score an upcoming adaptation of Pearl Buck’s “The Good Earth.” This true biographical information is laid out in the first few minutes of Tod Machover’s new opera “Schoenberg in Hollywood,” which received its world premiere from Boston Lyric Opera Wednesday night at the Paramount Center. 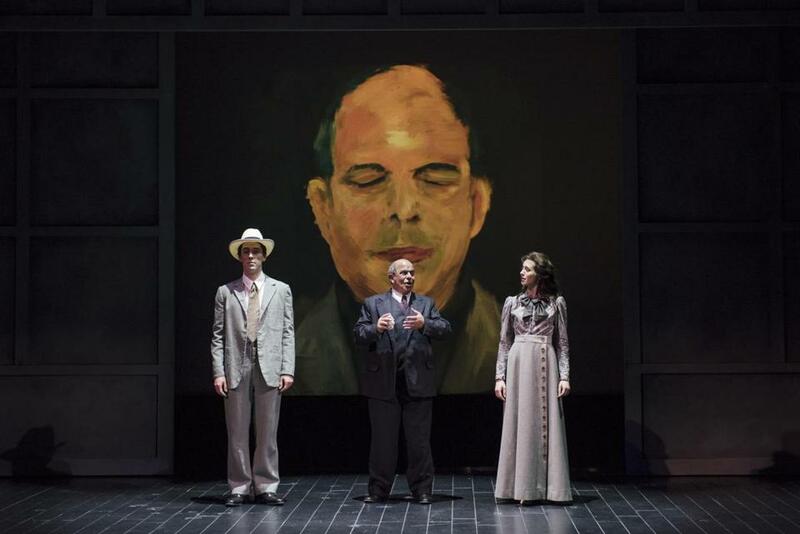 Based on a scenario by the late Braham Murray with a libretto by Simon Robson, the intriguing opera presents a newly stateless Schoenberg in the throes of a perpetual identity crisis stemming from the impression that no one has ever truly understood him or his thorny, tonality-averse music. Because scoring a film would require letting others change that music, he rejects the “Good Earth” offer and spirals into an even deeper funk. “Who am I?” he asks himself repeatedly over the course of the 90-minute show. The opera unpacks that question with exploration and parody of Tinseltown genre conventions, bolstered by oodles of film clips and projections starring the opera’s three-person cast: craggy baritone Omar Ebrahim as the titular composer, bright young tenor Jesse Darden and luminous soprano Sara Womble as everyone else. Those two first appear as Schoenberg’s students, then adopt the personas of parents, lovers, friends, and contemporaries. The composer’s childhood plays out in a silent film, with Ebrahim playing a toddler still in full suit and tie. His first wife cheats on him in a sendup of noir detective flicks, in which Ebrahim Sprechstimmes with a smoky snarl. He dances through a storm of bad reviews in Fred Astaire fashion. And the uprising of anti-Semitism in Europe is seen through the lens of Marx Brothers jokery. Full of the spiky dissonances Schoenberg loved, Machover’s score references a plethora of the earlier composer’s works, as well as films including “Psycho” and “Singin’ in the Rain.” (The latter is set to the words “I’m killin’ tonal music, just killin’ tonal music . . .”) BLO music director David Angus led a capable chamber ensemble through many twists. Ebrahim wholeheartedly gave himself to the lead role, with the character’s stiff, self-conscious affects eroding to reveal a wicked glimmer of humor. The baritone’s robust voice was expressive, though his fake Austrian accent was laid on a little too thickly. Darden and Womble have appeared in multiple BLO productions in minor roles, and it was great to see their substantial talents put to more use. When they played the students, their light and effervescent voices evoked the shiny American dream, available to the composer if he’d reach out and grab it. “Punk ballerina” Karole Armitage’s staging was crisp and effective. The same can be said of the sound design by Ben Bloomberg, who has been working with Machover since his undergraduate days at MIT; if there were any glitches in the constellation of speakers and microphones filling the theater, they weren’t noticeable. Simon Higlett’s imposing, cold sets telegraphed the composer’s feeling of alienation and revealed a surprise near the opera’s conclusion. All said, it was a little disappointing that for all the talk about being true to one’s self and one’s art, Schoenberg’s final eureka moment arrives with what feels like a false note. When the real Schoenberg met with Thalberg, the producer complimented the composer on his “lovely music;” the composer snapped back with “I don’t write ‘lovely’ music.” Yet when Schoenberg transcends his inner turmoil in the opera’s final minutes, he declares his resolve with the evening’s most melodious, ‘lovely’ music. Such a tidy ending could happen only in the movies.